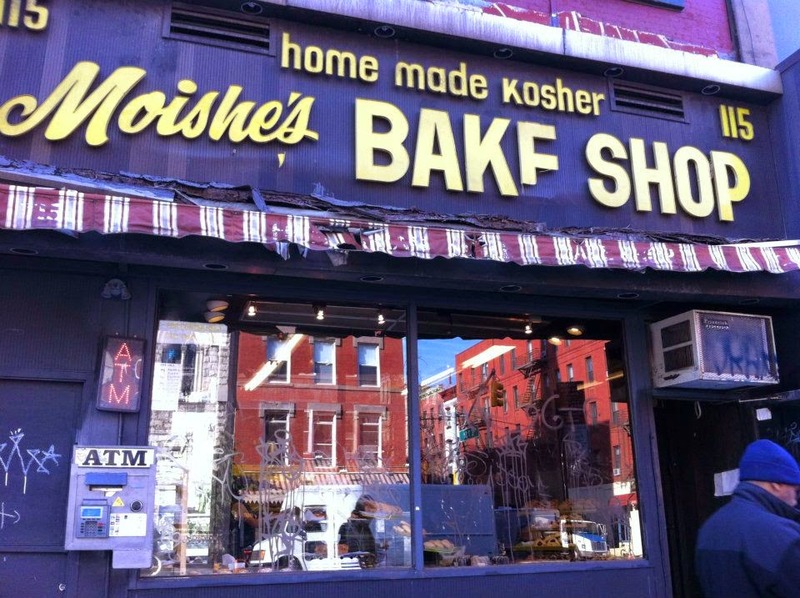 Last week there was an explosion on Second Avenue last week which was a few doors down from Moishe's Kosher Bake Shop. I was hoping they were not ruined by the fire . Thanks to 1010 WINS I know the lowdown . They are doing okay but business is very slow for obvious reasons. I think that they are fortunate that this happened not long before Pesach . Hopefully the after effects of the nearby fire will be cleared up enough so after Pesach things will be back to normal. If you look at the first photo at the fire, two buildings to the left of the fire is Moishe's . 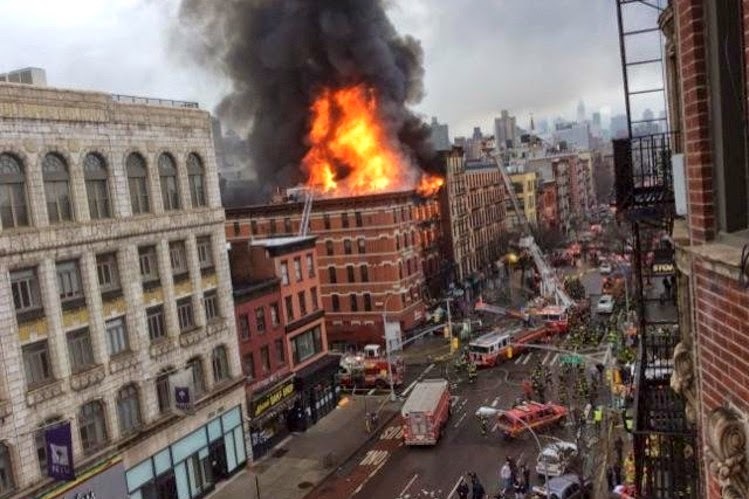 I send condolences to those who lost lives , homes and businesses due to the fire/explosion on Second Avenue last week. 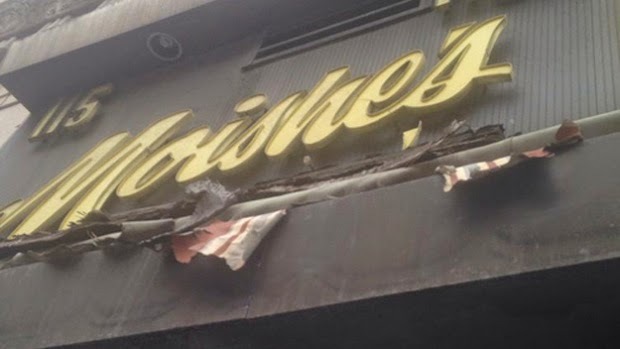 I am also quite grateful that Moishe's Kosher Bakery has survived. Because of this horrific tragedy so many more people know about the laws of not cooking on Shabbos than had before . I realize some people may feel it was more of a chillul hashem than a kiddush hashem, but I think its more of a kiddush hashem. It has opened dialogue that had not been there before. It makes my mad dash home to prepare for the arrival of shabbos more understood by my co-workers. I was fortunate enough to have only been met with good will while discussing this tragedy this week. People of all faiths were so sad to hear of the loss of seven children, especially those who have small children. So sad how sadness often unites people more than joy does. Have a good Shabbos full of Shalom and Bracha. A high profile celebrity who happens to be Jewish recently wrote an article disparaging Jewish men. Perhaps she even thought is was cutesy and tongue in cheek. Who knows. I won't dignify her words by linking to the article. The article is not the point. The spirit and essence of such an article is important to note. I do not find any of the cutesy insulting stereotypes of Jewish men or Jewish women that I hear in the media cutesy. They do not even remind me of any Jewish person that I know. I don't appreciate how it seems the only way these "cultural Jews" connect to Judaism is by heckling their distorted view of what Jewish people are like. I do not think its ok for Jews to disparage Jews so publicly just because they too are Jewish. Their anti Jewish sentiment is not less anti Jewish just because they are. It would be worse if their words were uttered by goyim but not really . Any way you slice it its lashon harah pure and simple. Why on earth does there need to be more negativity about Jews put out there , especially by "Jews"? Since Pesach is on the way , I thought that I would post this. Enjoy. There was a devastating fire in Brooklyn on Friday night that left seven children from one family dead . Two other family members were severely injured. I do not think that I can add anything more that has not been already said. I do not know all of the details nor do I want to . When people get all of the the details they start making judgements and thats where all of the trouble begins. Naturally, instead of dwelling on the details of this shattered family I will give my own thoughts. Lately I have noticed more sirens than usual in Midwood, especially on shabbos. Every time I hear sirens I hope that I do not know the victims. This shabbos was really no different. I heard a lot of sirens and hoped I would not get to hear why they went off. This time I heard the story behind some of the sirens. Very upsetting. Fortunately I did not find out until after Shabbos. When I turned on the radio (I know I'm old school) after shabbos I heard the story. They did not mention that they were frum, but I knew they were since they mentioned 7 children. I think what hit me most was the fact that someone had 7 children and I have none . No, this is not a pity party. Let me explain. I always fear being old and childless. When something like this happens it put things in perspective. Just because someone has something does not mean someone will always have it. This goes both ways. Life can change in a moment. The same way one can seemingly have it all one moment and then in another moment lose it all, one can have nothing and it can change. I have a friend who had lots of kids, but she unfortunately passed on at a young age and will not see her children grow up. I have other friends who married divorced or widowed men, One person's tragedy ends up with a simcha for someone else. The other thing that I took notice of when I heard of this fire is the fact that this family had lived in Israel for many years yet this tragedy occurred in the United States. The scariest part of parents losing children is that parents can't always withstand the pain. It can cause divorce. One thing about life that one can count on is that it is always changing.Sometimes one can feel so paralysed from the sadness of life that you just don't feel like leaving the comfort of one's home. I guess a tragedy like this can help the get up and go because tragedy can chas v'shalom occur anywhere so one may as well do whatever one needs to do in the home or outside of the home. Life is precious and its meant to be lived. That said, in memory of the seven children who lost their lives this shabbos, everyone needs to make sure their homes are fire proof and make sure they have working smoke alarms. This is really cute and really sad. Its not even relaxing to watch. I love technology, but there is something to be said about the good old days before there was so much of it. We all have expectations of others even if we should not. Perhaps they are not really expectations but they are more like ideas of what we would like them to be like. Sometimes when people do not reach one's expectations its not really that they disappointing but maybe they were never really capable of being whatever way one may want them to be. It can be hard to accept people for what they are capable of instead of what we would like them to be. I know this sounds like a cliche but it is so true. This is quite interesting. Victoria Hanna grew up religious to a Persian Jewish mother and an Egyptian Jewish father. She was a severe stutterer who was severely picked on . She is no longer observant but she writes songs. Sometimes the further you veer from something the more you end up going back to it. Or something like that. Her songs play with the use of Hebrew language and are tantalizing. This is a kol isha alert. Teaching is such a precious adventure. One can be a school teacher, or one can teach a specific skill to someone as a friend or a parent. One teaches others via employee training. Every time you teach you learn how to teach better. Those you teach help you become a better teacher because each person has a different way of absorbing the material and they teach you yet another way to impart the information. The trick is letting the give and take flow. Some people insist on being overbearing and do not let the student grasp the information in their own special way. Its such a crime when this happens. This can make the student resistant to the information because they are having the information forced upon them . Facebook can be good and bad. You have more access to more people than a dating website and yet someones profile can be just as off putting as a dating website profile. Someone that is a friend of a friend contacted me. He is definitely not for me religiously but that was not the disturbing part. He had photos of himself with women he had gone out with. Though he himself was OK looking the women he dated were twos on a scale of one to ten. I am embarrassed to say that it really bothered me that someone I do not even know who I am not interested in went out with some unattractive women and it made me even less interested in him. I guess its because if someone I did not know sees my picture and then is interested in me it means he thinks that I am attractive as my facebook profile is closed the only someone really sees is what I look like. He sends me a message saying he thinks I'm really pretty, but what does that mean? I see what he finds attractive and pretty to him means nice personality or smart. The crazy thing is this bit bothers me more than the fact that even if he usually dated better looking women he would not interest me. You can't win. One of the things that really disturbs me about all of the media attention on Ferguson , Missouri is that it is avoiding the greater problem at hand . The good old boy network is alive and well in the Midwest, In other words, anti-semitism and hate of anyone other than the WASP is alive and well. Black people are not the only ones who are discriminated against. Those who discriminate against blacks also discriminate against anyone who they think is not like them. Case in point the sad case of Tom Scweich who actually was not Jewish, but was discriminated against because he had a Jewish grandfather. I really did not follow the case of Tom Schweich all that much, which is why I attached the above article. Basically Schweich who was Episcopalian and was running for office in Missouri . There was a whisper campaign out against him by his opponents saying that he was Jewish and this of course was so all of the good Christians who prefer a pure bred Christian candidate would not like him. They also had a picture of Schweich who looked very Jewish and said they were going to crush him like a bug. The thing that I find especially disturbing is that he was not Jewish. He did acknowledge his Jewish grandfather, but he really was Episcopalian and with the exception of some reform Jews would not have been considered Jewish by Jews. Of course he would have been considered Jewish by Hitler. Regardless, this whole incident was anti-semitic. Schweich could not handle all of the pressure and committed suicide which makes this all so awful because though this happened there also is no way to know if this brutal campaign could have been stopped and if justice could have prevailed. The other thing that I grapple with is the who is or isn't a Jew factor. Would this whole story gone differently had Schweich's grandfather married a Jewish woman and had his father married a Jewish woman? Would he have been able to deal with the anti-semitism easier had he been fully Jewish or was it harder for him to deal with because he was not actually Jewish? I do not really know. I think that it would be hard for him either way. This was a case of anti-semitism as much as the non-Jews who were killed outside of the JCC in Kansas City last year . Probably even more so because Schweich had Jewish ancestry. It just goes to show you that no matter how hard a Jewish person might try to leave Judaism the Jewish part of them prevails. Men intermarry and perhaps "convert" and think that their kids will have it easier because they won't be Jewish and yet their Jewish side is still there even if they aren't actually Jewish. These descendants inherit the worst of both worlds. They do not get to enjoy the beauty of the Jewish religion because they aren't actually Jewish but they inherit the anti-semitsm. I would say that is a bum deal. A good advertisement for men not to intermarry if there ever was one. I send condolences to the family of Tom Schweich , to his wife and especially to his children. Unfortunately anti-semitism still exists in the United States. I saw the movie DELI MAN yesterday. It is a documentary about delis and how they are becoming extinct. What I found extremely interesting is though many people associate delis with Jews , they really weren't created by Jewish people. Delis did not exist in Eastern Europe. There were delis in Germany , but they weren't really a Jewish phenomenon . German delis were highly trief as they had a lot of pork products there. Germans brought the deli to the United States and in the early twentieth century they were the fast food of the time. When Eastern European Jews came to America the young people were enamoured with deli cuisine and many Jewish people opened kosher delis , and added some Eastern European dishes to the menu. A kosher or Jewish deli was a way for immigrant Jews to assimilate into American culture and eventually delis became associated with Jewish culture. Jewish food really is the food of the countries we live in . The United States is no different. The film interviews several deli owners from around the United States and Canada. This is where things got very interesting. They featured a Houston based deli , a Toronto based deli , a California based deli as well as a few in New York. The golden age of the deli was the 1930's and 1940's. This explains a lot. I never really thought of delis as being Jewish or as having Jewish food . The golden age of the deli was way before my time. It was more of my grandparents' era. My parents were very heath conscious . Though we never had white bread, we rarely ate cold cuts. The movie is more like an ode to the deli rather than a celebration . Many of the old Yiddish speaking immigrants have passed on . The younger generation that is not so observant is not so into deli food. Religious Jews aren't necessarily into deli food. The few deli's that exist are of a dying breed. This is not necessarily a bad thing. Aside from being kosher or matzoh or challah, Jewish food is not really a specific cuisine, its more dependent on what country that Jews live in. Ziggy Gruber has a deli in Houston where one would not think of as being a great place to open a Jewish deli, but he is successful because he has become somewhat of a Jewish celebrity there and his restaurant has become a place where Jewish people connect to their Judaism. DELI MAN does not really specify whether most of the delis in the film are kosher . It mostly explores a deli as being part of 'Jewish culture', Katz's , Carnegie deli and Stage door are mentioned as being specifically not kosher but of the deli men featured in the film the kashrus of their institutions are not really explored. DELI MAN does not make me want to eat a corned beef sandwich,. It does not really make me wish that I lived in the golden age of the New York deli. It is however a nice epilogue to the golden age of the deli and to the 'gastro Jew' . Feivish Finkel, Freddy Roman and Jerry Stiller are featured as New York Jews reminiscing about delis. I am not sure that the goal of the film was comedy, but I did find the film to be quite comedic. Judaism really is about religion. Kashrus separates us from the rest of the world, but the genre of our kosher food is not what keeps us around. Thank goodness. It really does not matter whether or not Delis exist twenty years from now. Judaism will be making Jews Jewish as it always has been. I always feel uncomfortable when I see ads from frum publications that blot out women's faces or exclude women from the pictures altogether. Maybe it is because I am single. Then again I think its just because I am a woman. Most of the time this issue does not bother me because the frum people who I choose to associate do not agree with those who want to blot out women's faces from frum publications. The strangest part of all is that I believe that the elimination of pictures of women from ultra-frum publications is counter productive. If there aren't any photos of modest religious women then there will only be photos of less modest and less appropriately dressed women around. Is that really better? If I were living in an extreme muslim society where women were not in any publications anywhere around me then it would not bother me, but in the United States , even in boro park you can go to the news stand and buy a secular magazine that has pictures of women in it. Instead of taking the opportunity to make a kiddush Hashem and having positive role models of women in print the extreme frum would prefer to eliminate woman altogether from their publications. When I saw this ad recently it really made me sad. 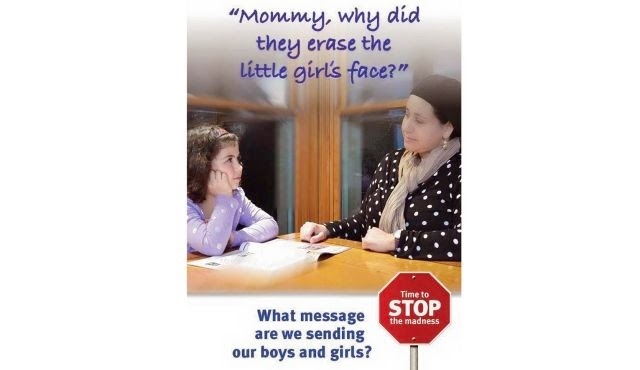 I am orthodox, but not charedi so even if I had a daughter it would be a little easier for me to explain. Tzniut is important, but I think that the fixation with it in frum society as the reason for all of society's ills is a bit misguided. I think that introspection and a fixation on honesty in business would be a better fixation than focusing on a mitzvah that only pertains to women. Or maybe just take turns focusing on each of the 613 mitzvos in a rotation. Its like women aren't important until its time to blame someone for the ills of society. Its all ridiculous anyway. So often the one who has the loudest voice creating these illogical chumrahs is just all worked up because this is his biggest yetzer harah. I posted this video last Purim season, but its so cute I had to post it again this year . Enjoy! This is another cute Purim video. Enjoy! I have a friend who is in her late thirties who was feeling a bit depressed lately . She has a chronic disease . She is single and she was saying how she did not mind the thought of death. She felt like her life was meaningless because she does not have any children and feels that no one would miss her if she was gone. Thank goodness I myself am not suicidal and the notion of it is never on my mind. I did not even realize how frightening her thoughts were until after our conversation. To begin with I told my friend that I am sure her family and friends would miss her if she was not around. I would miss her. I myself love living. I feel like there is so much to do, so much to experience and so little time to do everything that I want to do. I told her that life is wonderful, it doesn't turn out the way you would expect it to , but its still worthwhile. I encouraged her to explore hobbies and other things that may interest her. Due to her illness my friend cannot give birth to a child. Of course this is upsetting, but the thing is , having a child is not the only important thing in life. Being a parent is something that I have always wanted to do , and hopefully will be able to do, but it is not the only way one can have a meaningful life. Years ago I did hear a rabbi at one of the shuls I attend give a speech about while having a bunch of kids, living in a house with a two car garage are all wonderful, but they are not really what you have to have to be a Torah observant Jew. One is required to observe the mitzvos to be a Torah observant Jew. A novel idea. Its not that all of these things are not things that one should want but if one does not have them all is not lost. The rabbi who made this speech had a congregation comprised of many singles and divorced people, but I do not think that he was pandering to his audience. Many people feel like their life does not begin until they are married. People get married at all different ages . One has a life when one is single. Life is precious and must be appreciated. What if someone never marries ? Does it mean that they have never had a life? I think that sometimes people are looking for major things in life to justify the validity of their existence instead of looking at the smaller things. I prefer to look at the smaller picture. I love watching sunrise as I walk to the train in the early morning. The colors are so beautiful . Most of Brooklyn is still sleeping then , so the streets are a bit quieter . Preparing and then eating a good meal is so satisfying Spending time with friends recharges my soul.. The peaceful calm of a reading a book or taking a walk on Shabbos, seeing little kids dressed up on Purim ,and sipping a vibrant cup of tea are all simple pleasures that make life worth living. Not everyone marries , even if one marries there is no guarantee that one will have a child. . It is important to strive to have these things, but having these things should not be the only way one can feel like a viable individual.